29/09/17 – Updated to cover new build/release editor. Screenshots still show the old editor. Also sorry about the double quotes in the code snippets, they are being replaced with pretty ones and you have to use normal ones, I’ll sort it out sometime. We are using Visual Studio Team Services online for source code, task and release management. The question is, how to get the variables set here to update your config files at deploy time. One way I have found to do this is as follows. Step 1. Add Parameters.xml file to the website project. This file defines the values that need to be updated. This can replace tokens in any text file, xml files have better support using xpath to target attributes/values to replace. For the defaultValues, set the value to a token that can be replaced during release. In this example I am using the default token format used by the Replace Tokens utility described later. I have to credit this post from Colins ALM for explaining this, although it is about TFS the first half still applies. Note that connection strings are special and the values are replaced with tokens automatically during package creation. The original value is placed into the SetParameters.xml file. So to get your own token in there, you either need to add a config transform and replace your local connection string with a token, or follow the link above and set up a publish profile that defines a connection string token that will be used in the package. This is ideal to replace at release time with a simple token replace task. In the release definition, add a separate environment for each environment. Each environment has a list of tasks. First I have added a Replace Tokens task using this add-on from the marketplace. Or on the Variables tab as shown at the top of this post (old and new editor – for old editor, switch using the dropdown at the top right from Release variables to Environment variables). The deploy step for us is a normal Azure website deployment which uses web deploy. This defines the subscription, web app, slot, and web deploy package. NOTE: You have to tick ‘Publish using Web Deploy’ for the SetParameters box to appear. If you have issues with the token replacement, you can use a command line “Type” command to output the replaced version of the SetParameters.xml file to the release log that you can check has been replaced properly. One thing to note, I found that if you change the environment variables, and trigger a release, it won’t overwrite the web.config. It requires a new build. I think this is because web deploy uses the file date/size from the package to compare against the site, and this isn’t changing, so it doesn’t replace it. If anyone knows a way around this, let me know! This has been really useful reading. 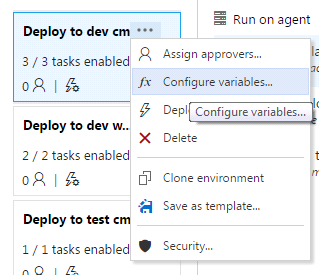 Do you have any idea why I don’t get the option to specify a SetParameters file under the additional deployment options of the Deploy App Service task? I went through this again with the new editor. It looks different but the steps are about the same. After you add the ‘Azure App Service Deploy’ release step (now version 3. *) , select the Azure subscription and App service name, then expand Additional Deployment Options. Tick “Publish using Web Deploy”. Then the ‘set parameters.xml’ box appears. I’m sure this used to be ticked by default, I guess they changed it to simplify the setup when deploying a simple zip file. Thanks Andy – I was just missing the publish using WebDeploy checkbox! Thanks, you’ve saved me from several hours more frustration! Thanks for providing the community with this tutorial. I found the entire article helpful. Keep up the good work. Things have changed a bit, but overall the process is the same.